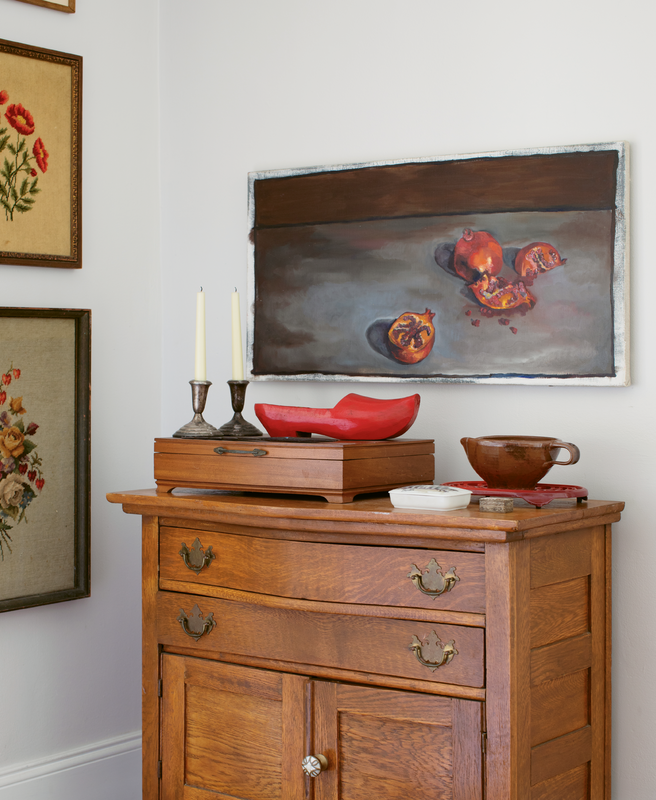 Jacques and Carrie Larson’s West Ashley home looks contemporary from the curb, but it’s filled with meaningful pieces from the past and present, like this pomegranate still-life by Carrie, needlepoints by Jacques’s grandmother, and a red clog carved by his great-grandfather. FAMILY HEIRLOOMS: In the living room, a mid-century vibe reigns thanks to a Herman Miller coffee table and Eames chair, both hand-me-downs from Jacques’s father. The umbrella plant behind the couch is also a family keepsake: after nurturing it for more than 40 years, Carrie’s father passed it down to her for safekeeping. 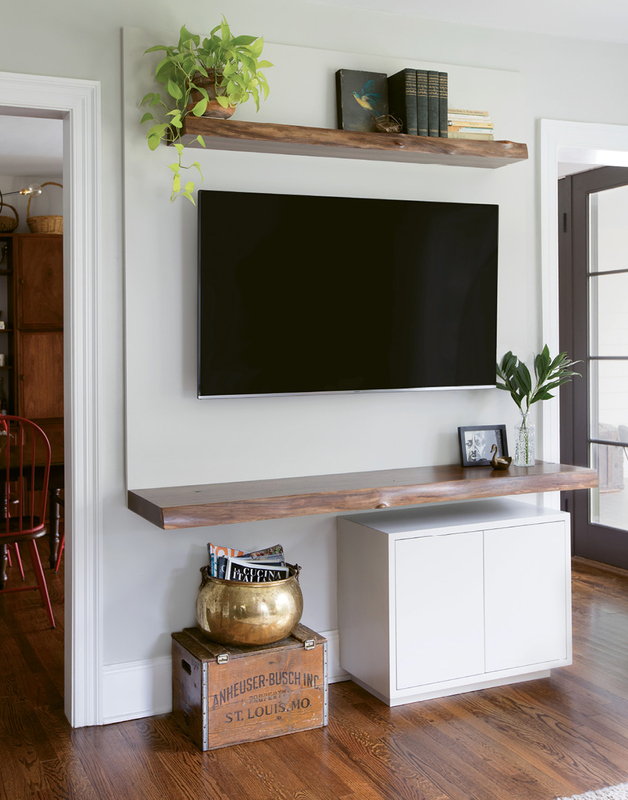 Crafted by local carpenter and friend Dan Perrin of Perrin Woodworking, this custom media console echoes the look and feel of a mantel. WHERE THE MAGIC HAPPENS: Thanks to the removal of a wall between the kitchen and living room, cooking for guests is no longer claustrophobic. 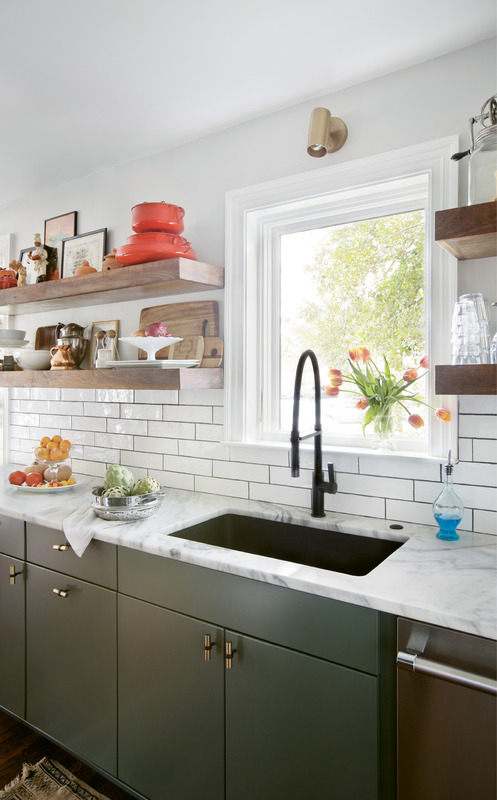 The refreshed space makes good use of local materials, including the faucet from Molufs and painted concrete backsplash from Palmetto Tile. 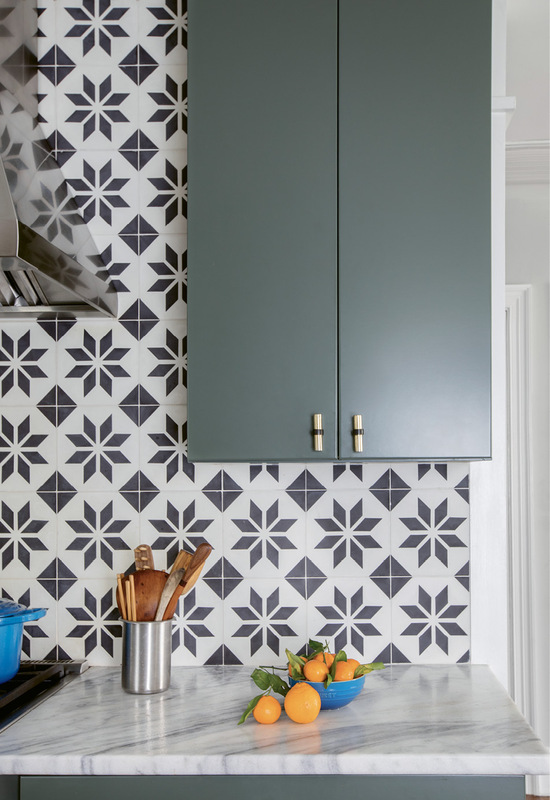 “Tile can really make a space without being too distracting,” Carrie notes. 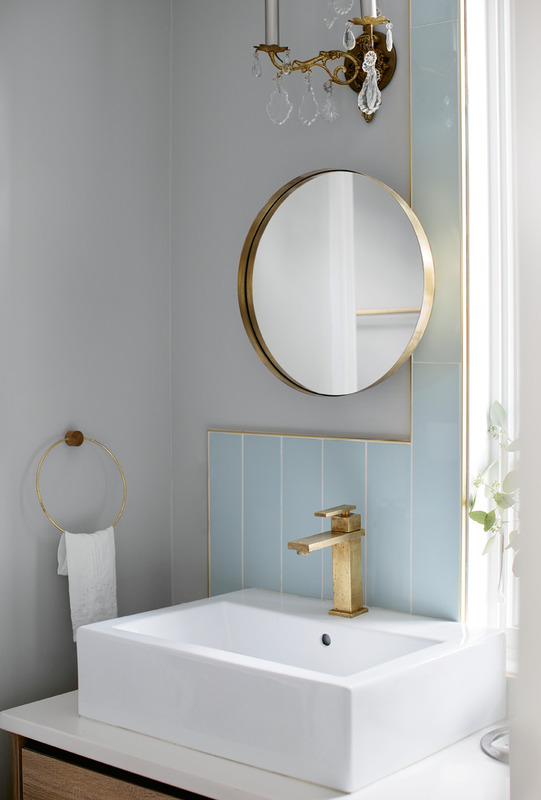 Quartzite countertops, flat-face cabinets, and hardware from Anthropologie add to the clean look, while a rotating display of objects provides the finishing touch. “We love the open shelves, and I find I’m always rearranging and shuffling things around; it is really inspiring to see fresh produce and artwork in the kitchen,” she continues. 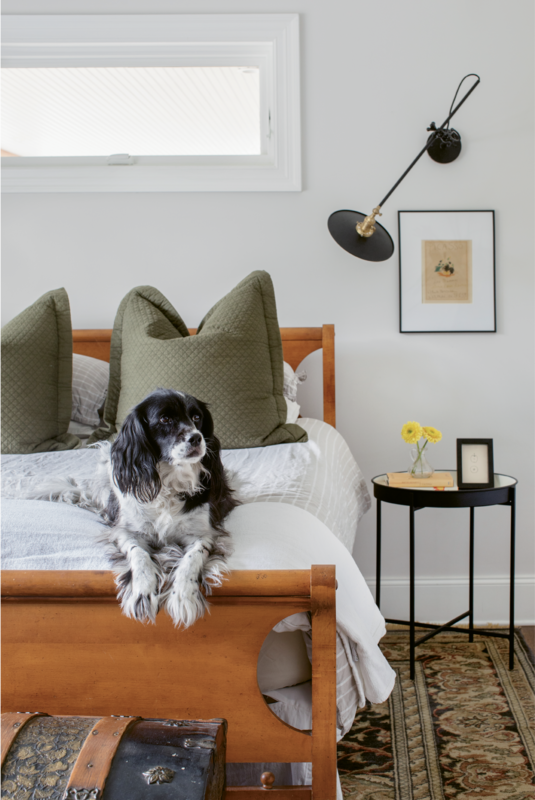 MIX, MASTERED: In the couple’s bedroom, a hand-me-down rug helps establish a color palette of earthy neutrals and olive greens; black accents, such as the sconce by Workstead, keep things grounded. In the master bath, contemporary mirrors from Hausful commingle with antique sconces for a look that’s both vintage and modern. PERSONAL TOUCHES: Portraits of jazz greats Thelonious Monk and Dizzy Gillespie, painted by Jacques himself; above the cabinet is a portrait of a farm once owned by Jacques’s family, framed in wood from the very barn that’s pictured. HOMEGROWN: Carrie, who coordinates Lowcountry Local First’s Growing New Farmers Program by day, enjoys cultivating food for her own family at home. She and Jacques worked with Ables Landscapes to install raised corten steel beds filled with lettuces and other seasonal produce items. 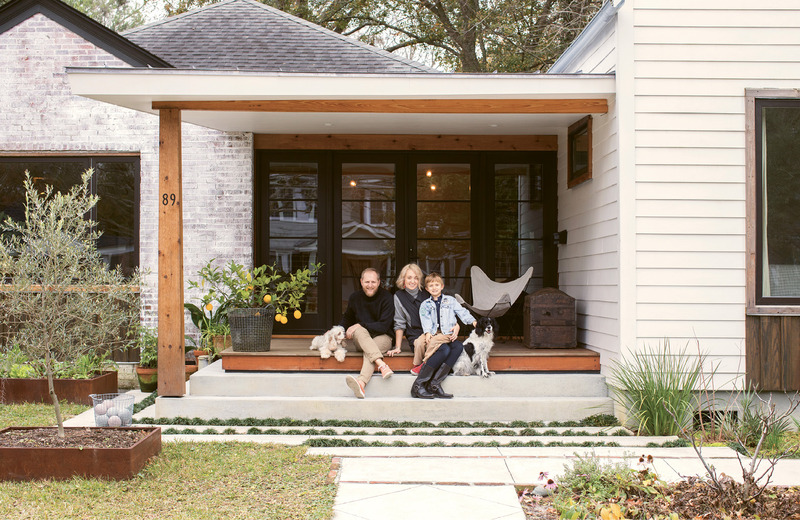 Jacques and Carrie Larson, pictured here with six-year-old son Jack and pups Lily Bean and Maggie Mayhem, hired Alicia Reed of Reggie Gibson Architects to help them transform their West Ashley cottage into a modern home perfect for the way their family lives and eats. Jacques and Carrie Larson know how to transform a handful of ingredients into something spectacular. As executive chef of Wild Olive and The Obstinate Daughter, Jacques has made a name for himself by doing just that. 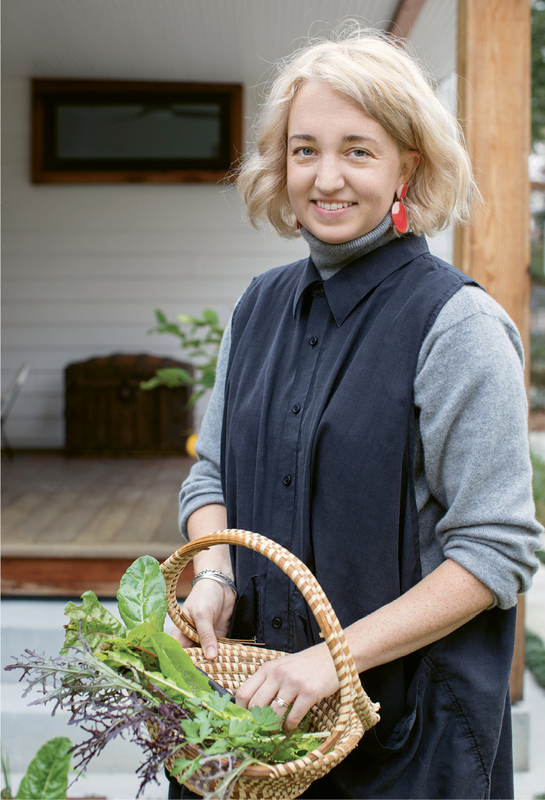 Carrie, who chairs Slow Food Charleston and works for Lowcountry Local First coordinating its Growing New Farmers Program, has culinary chops, too. 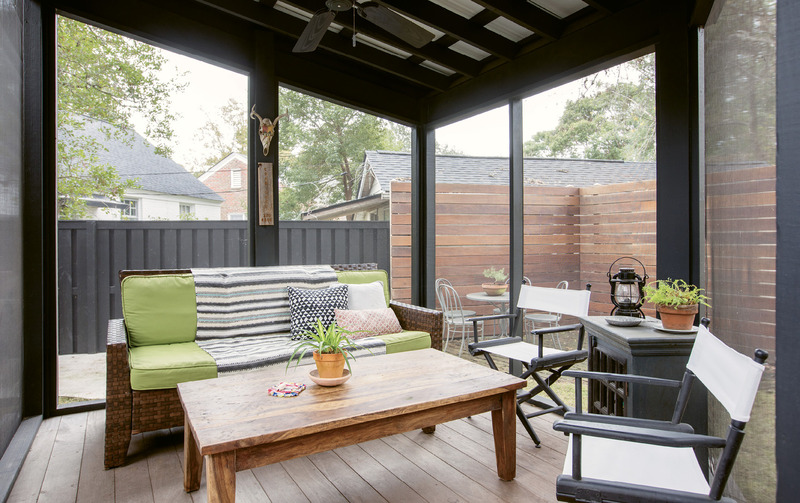 But one glance at the pair’s recently renovated West Ashley home proves their creative talents go beyond the kitchen. What was once a tiny red-brick bungalow is now a stunning contemporary structure with thoughtful spaces for living, cultivating, and cooking. On a mild winter afternoon, Carrie’s putting that space to good use, simmering beat-up lima beans and tomatoes rescued from an “ugly produce” discount bin and herbs from her own front yard into a hearty New Brunswick stew. As she stems some rosemary, she fills us in on the process behind the renovation. “Jacques bought the cottage in 2005, and since we married in 2011, it’s been our home,” Carrie says. 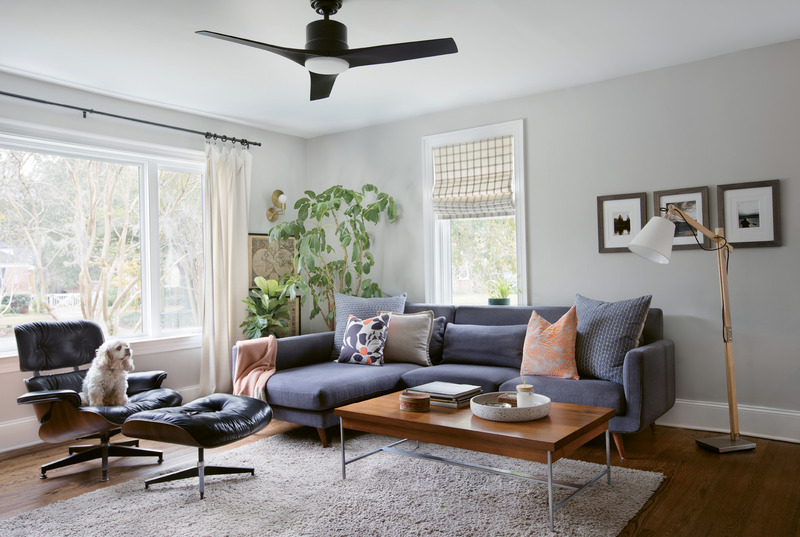 When the pair welcomed their now-six-year-old son, Jack, their growing family began to feel cramped in the 900-square-foot, two-bedroom, one-bath house. “It was really quaint, but also really small, and the layout—with several small rooms separated by doors—felt closed-off,” she adds. 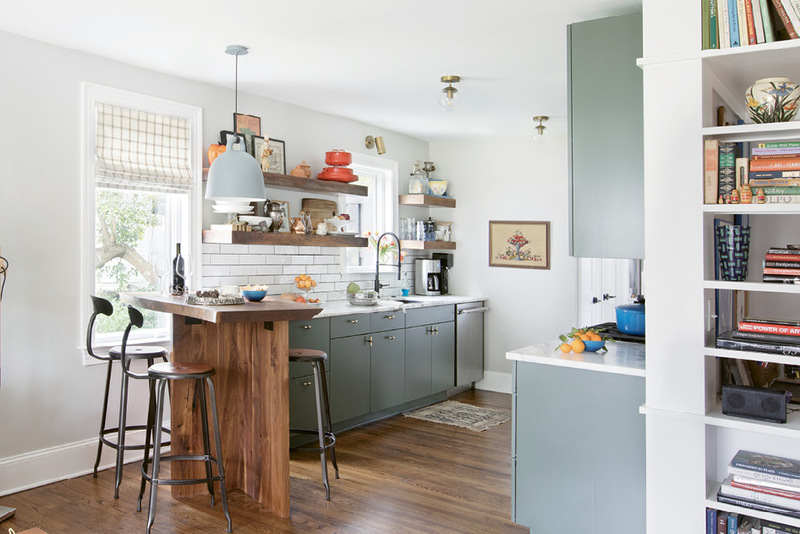 Perhaps the biggest challenge for this food-centric pair was the galley kitchen. “When we’d throw a party, friends always wanted to hang out in the kitchen, and it just made me claustrophobic,” Jacques recalls. In envisioning a home that supports the way their family cooks, eats, and lives, Carrie and Jacques were able to meld the right ingredients—a beloved neighborhood, a simpatico architect, and a desire to preserve the home’s history while simultaneously embracing modern lines. On this laid-back afternoon, it’s clear they got the recipe right: as the stew’s inviting aroma wafts from the kitchen and Ranky Tanky tunes pipe through the speakers, Jack zooms from the yard to his room with a neighbor friend; Carrie putters in the garden; and Jacques reads in his Eames chair, a piece handed down from his furniture-collecting father. “The house is now 1,670 square feet, but it lives large,” Carrie says. “There’s an efficient use of space and a real sense of flow.” That sense of flow—coupled with the deeply personal items and family heirlooms displayed throughout—lends an effortless feel to the space. Designing and building it, however, wasn’t quite so easy. The challenges posed by the triangular shape of the lot, the petite scale of the surrounding homes, and the Larsons’ desire to introduce modern elements all led the first architect to pass on the project. A second accepted the job—but only if the couple would agree not to stray too far from the neighborhood’s cottage aesthetic. 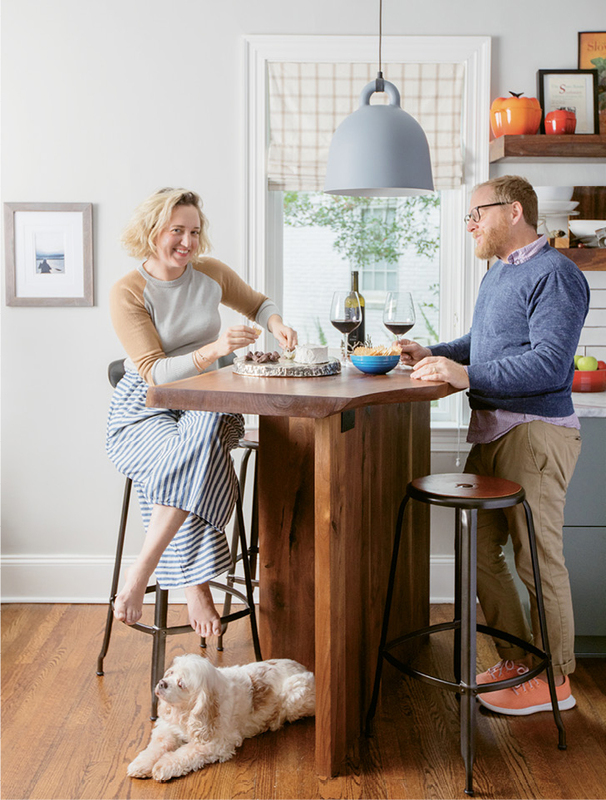 For Carrie and Jacques, that was a deal breaker: “We were pretty adamant that we wanted to break the mold,” Carrie notes. 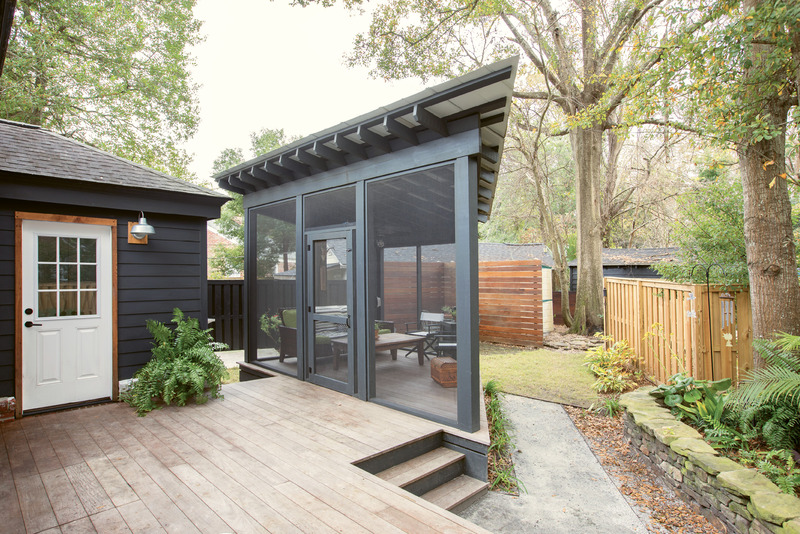 The project finally took off when the couple sat down with Alicia Reed of Reggie Gibson Architects, the same firm that designed The Obstinate Daughter. Reed immediately understood the Larsons’ vision and began sketching out solutions to the apparent design challenges. “It was a very delicate balance of embracing the old house but still doing something modern that complemented the neighborhood,” she explains. With this in mind, Reed designed a 770-square-foot addition that builds off the front plane of the house, extending into the front yard (the point of the triangular lot is in the back). The build-out created space for a master bedroom suite, a playroom for Jack, and a mudroom with a half-bath. The shape of the addition’s front facade closely mimics that of the original structure, but the scale is larger and the material, fiber-cement board, has a more modern feel. In the rear, just off the back deck, a separate screened-in porch stretches toward the tip of the property line. 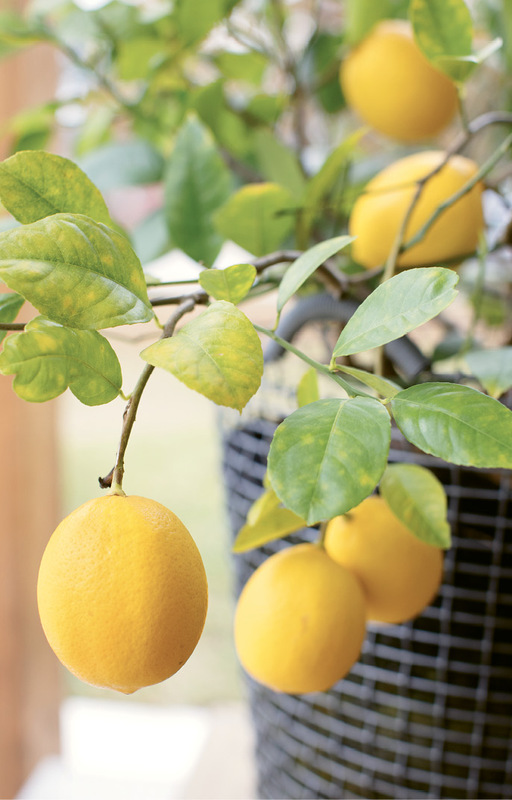 The porch’s 45-degree angles make great use of the odd-shaped lot; the front half of which is devoted to green space, including raised beds offering a riot of vegetables, plus lemongrass, Meyer lemons, agave, and even an olive tree, installed with help from Ables Landscapes. That mix of aesthetics is echoed in the fixtures and furnishings, which the Larsons chose themselves, focusing on local providers. There are industrial-modern light fixtures from Workstead in the master bedroom and living spaces, gilded sconces from Antiques of South Windermere in the master bathroom, and a patterned painted concrete tile from Palmetto Tile in the kitchen. New modern furnishings from West Ashley shop Hausful commingle with family heirlooms, like a collection of framed needlepoints sewn by Jacques’s grandmother and a Herman Miller coffee table passed down by his father. A small Spring Island hideaway finds one Tarheel couple living large among Lowcountry foliage.